Because of such constant use, a naturally straight, symmetrical smile is often a rarity. Whether due to years of wear, hereditary factors, or unhealthy oral habits formed in childhood, a misaligned smile not only affects aesthetics but can impact oral health and overall quality of life. It is highly recommended for those experiencing the negative repercussions of crooked teeth or misaligned bite, to seek professional correction with orthodontic treatment. At Dr. Z Dentistry, compassionate dentist, Dr. Held, and his experienced team proudly provide highly personalized orthodontic services while using the latest in dental technology to help diagnose and treat minor to complex malocclusion and bite irregularity issues. We also happily work with patients to help them achieve straighter teeth, proper dental function, and longer-lasting oral health. From early intervention with reliable, traditional metal braces or ceramic braces, to more discreet, customized orthodontics for adults and responsible teens with clear aligners, we provide a variety of options as unique as your smile. Contact our Indianapolis office to schedule your appointment today! The benefits of a straight and healthy smile cannot be understated. Although modern orthodontics didn’t become a specific branch of dentistry until the very early 1900s, even our ancient ancestors understood the value in achieving a straighter smile. Crooked teeth that do not align properly are more difficult to keep clean. This puts your smile at a higher risk for tooth decay, developing gum disease, and tooth loss. Malocclusion, or uneven bite issues, can also put additional stress to the chewing muscles of your smile. This can easily lead to headaches, TMJ disorders, neck, shoulder and back pain. Aside from the many adverse effects crooked teeth and a bad bite can have on proper dental function and oral health; misalignment can also detract from the natural aesthetics that make your smile unique and beautiful. A smile that is made free of alignment or bite issues from professional orthodontics is well on its way to optimal oral health. Many different types of fixed and removable orthodontic appliances are used to help shift teeth, retrain muscles, and reposition the jaw into proper alignment. These appliances work by putting the teeth and jaw under gentle pressure. However, time of treatment and the most effective approach will depend on the specific severity of your orthodontic issue or issues. What Smile Issues Can Orthodontics Treat? Only your dental professional can determine if orthodontics can help you. Based on diagnostic tools that include a complete history of your medical and dental health, a clinical examination, an impression of your teeth, and special X-rays, your dentist can decide if orthodontics is ideal and develop a treatment plan that is right for you. Overbite-is where the upper front teeth lie too far forward, or stick out, over the lower teeth. Underbite-involves the lower teeth are too far forward or the upper teeth too far back. Crossbite-is when the upper teeth do not come down slightly in front of the lower teeth when biting together normally. Open Bite-is a space between the biting surfaces of the front and/or side teeth when the back teeth bite together. Misplaced Midline-occurs when the center of your upper front teeth does not line up with the center of your lower front teeth. Uneven Spacing-involves gaps, or spaces, between the teeth as a result of missing teeth or teeth that do not fill the mouth. Crowding-happens when there are too many teeth for the smile to accommodate. Many of the above conditions can be the result of needed extraction, genetics, the premature loss of baby teeth, retention of baby teeth, thumb- or finger-sucking, accidents and certain types of dental disease can also result in a need for orthodontic treatment. What Types of Treatments are Involved in Orthodontics? In today’s orthodontics, there are many treatment options. From retainers to clear aligners, to invisible braces, metal, ceramic and micro. And each one has their uses. Our team has the knowledge and expertise to consider all options, based on variables such as your age, possible jaw imbalances, differences in teeth size, and more. We know what to use and when to use it, and we’ll happily work with you to make the best choice for your smile. What are Traditional, Metal Braces? Traditional, metal braces are a suitable option for addressing medium to severe alignment problems in patients of all ages. Dr. Held manipulates the tension gradually with traditional braces with wires and brackets attached to the surfaces on your teeth that shift your smile into the desired alignment. Traditional metal braces are highly reliable and can help correct complex misalignment, bite, and jaw problems. Durability and Strength- Compared to other materials available in orthodontic treatments, metal braces are the most durable. Affordability- Metal braces are typically the most affordable orthodontic treatment option, so achieving a straight, beautiful, and healthy smile is more attainable than ever. Versatility- Not every orthodontic treatment option will be ideal for every patient. Some options simply don’t have the capabilities to handle the most severe malocclusions. But, with metal braces, treating even the most complicated orthodontic issue is possible. Speed- Because of traditional braces’ metal workings using pressure on all your teeth at once, treatment time can often be quicker than other orthodontic options. However, the length of treatment will depend on your specific orthodontic case and severity of issues. Variety- Metal braces are now available in various designs for offering true variety and versatility. Today, you can find metal brackets in the basic design, with self-ligating components and those that are attached lingually (or on the back surface of the teeth). Personalization- Show off your personality by opting for elastics in your favorite colors, support your favorite sports team, or celebrate an upcoming holiday with the color of your orthodontic rubber bands. Stay on track- Because traditional braces are permanently affixed to our teeth for a period, they are always working. You’ll be able to stay on track with your orthodontic treatment, without having to overthink about them. How do I Properly Care for My Braces? If you and Dr. Held decide that metal braces are the right choice for your orthodontic needs, our team will discuss with you how to properly care for them. At-home care instructions often involve watching what you eat, brushing and flossing appropriately, and, most importantly, keeping up with your follow-up appointments for proper adjustments. Avoid chewy foods, like soft candies, as well as hard, crunchy foods that could damage the components of your braces. Certain fruits and vegetables may need to be cut up into smaller pieces to avoid getting stuck, and thus, causing others issues like tooth decay if not cleaned away properly. Taking proper care of your teeth is always important, but it is especially true when you have braces. Brushing and flossing regularly will keep your braces looking good, help you avoid enamel staining from leftover food or drink particles, and keep your smile free of potential tooth decay or gum disease. Since you’ll be wearing your braces for a certain period, it’s important to follow your dental professional’s instructions and care for them properly. While braces may seem like an inconvenience, once your treatment is over, your newly straightened, beautiful smile will be all the reward you need. Ceramic or clear braces are made of clear or tooth-colored materials and are designed to blend in better with your natural tooth color. They consist of brackets and wires, just like regular braces. The main difference is they’ll be less noticeable than traditional, metal braces. It used to be that only the brackets for these braces were ceramic, while the wire itself was made of metal. These days clear wires are available as well, making these types of braces even less visible. Though it’s a common misconception, ceramic braces are strong and durable like traditional bares and can be used to treat minor to more complex misalignment issues. Have Questions About Ceramic Braces? Ask the Team at Dr. Z Dentistry! When meeting with Dr. Held and his team for your orthodontic consultation, consider asking these helpful questions about ceramic braces if you’re interested! Do ceramic braces take longer? Can I drink coffee with ceramic braces? Do ceramic braces stain easier? Are Ceramic braces recommended for children? What are Clear Braces (Aligners)? “Invisible braces,” “clear braces,” consumers may call them “Invisalign,” clear aligners are just that, clear. Since their first introduction over 15 years ago, these plastic trays have been a highly popular technological advancement in the world of orthodontic treatment. They are so popular because their virtually invisible design provides a discreet approach to straightening smiles. They are often ideal for individuals who want to keep up natural or professional appearances while addressing crooked teeth, bite, or issues. 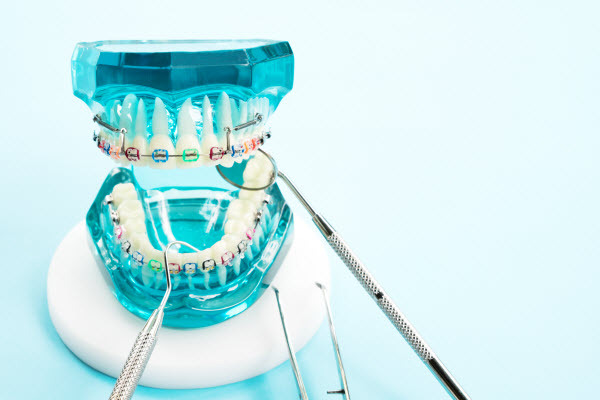 For many years, clear aligners were only recommended for minor to moderate orthodontic conditions; however, with more advancing technology, invisible braces are now being prescribed for more complicated issues. It’s important to understand, however, that depending on your orthodontic treatment needs, invisible aligners may not be ideal. Be sure to contact Dr. Z Dentistry to find out. Like traditional braces, aligners are designed to shift teeth gradually over time. Before treatment begins, our team will conduct a detailed consultation discussing your unique needs, concerns, and expectations of treatment. We will then take diagnostic measures including x-rays, photographs, and impressions or digital scans of your teeth to obtain an accurate blueprint of your smile. After gaining this information, Dr. Held can arrive at a proper diagnosis and then work with the outsourced aligner software to design your smile and plan the treatment process. The primary goal is achieving a healthy bite, jaw position, and, of course, straighter teeth. With this end goal in mind, a series of plastic aligners are created using the impressions or digital scans of your smile as the starting point. Think of the aligners as plastic replicas of your teeth. Wearing them puts gentle pressure on your teeth, gradually repositioning them. Each set of aligners is worn for a week or two before going to the next set. Over time, teeth reach ideal positioning. The total number of aligners will vary depending on your orthodontic needs. As with traditional braces, patients will need to wear retainers after their teeth reach their new positions. Because these plastic trays are removable, treatment is typically recommended for adults and responsible teens, as these age groups tend to wear their aligners for the appropriate time of 22 hours a day. Patients with optimal oral health, free of damage, infection, or decay may also be ideal for invisible braces treatment. Appearance- Perhaps the biggest benefit to clear braces is their aesthetic appeal. They are virtually invisible so that patients can straighten their smile discreetly. Comfort- Clear trays fit comfortably over your teeth without any additional fixtures to irritate soft tissues and cause problems. Convenience- Being able to remove the Invisalign aligner trays allows patients the freedom to eat or drink without worry. Hygiene- Patients do not have to stress about treatment altering their daily oral hygiene routine. The aligner trays can be removed for proper brushing and flossing. Treatment time- Because these clear braces are typically designed for patients with mild alignment issues, a straighter smile can typically be achieved anywhere from twelve to twenty-four months. Expected results- with clear aligners, patients undergo treatment planning that is fully computerized. Therefore, they know exactly what to expect and how long they will need the braces before they begin wearing them. 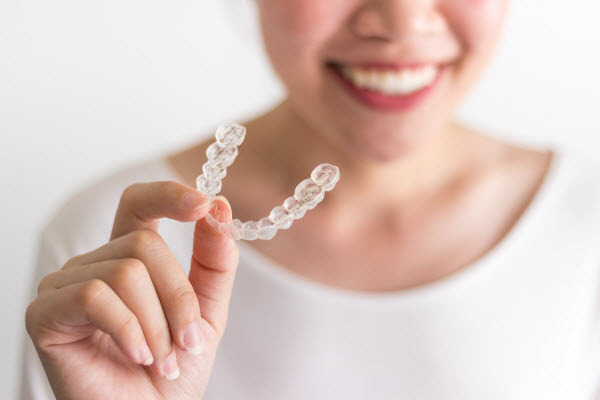 Renewed confidence- For many individuals who wish to achieve a straighter, healthier, and more uniformed smile, clear aligners make it possible without the need for more noticeable metal components. This can help significantly enhance self-confidence. Are You Ready to Achieve Smile Uniformity and Longer-Lasting Oral Health? Contact Us Today! If dental alignment issues are hindering your ability to speak or chew, you should consider orthodontic treatment. Dr. Held and his team help patients achieve the healthy smiles they deserve by offering personalized orthodontic counsel and outlining effective treatment plans. To schedule your consultation for our orthodontic services, call our office today!